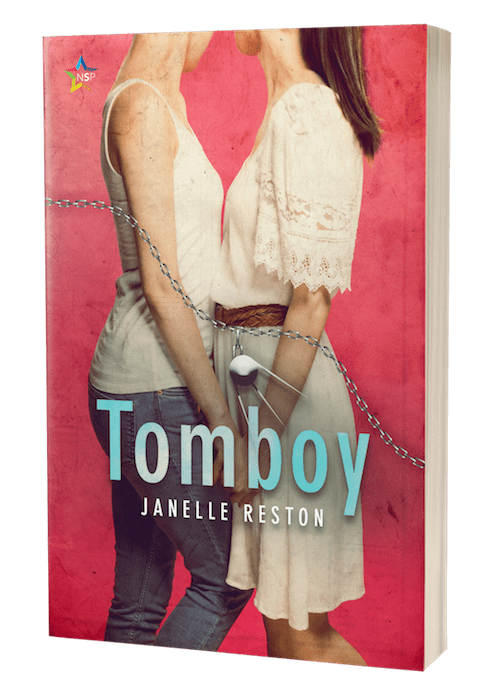 Harriet, the narrator of my coming-of-age romance novella Tomboy, never explicitly states where she grew up in the United States, but she drops some clues. Probably the biggest one is when she mentions her fellow classmates going back-to-school shopping at Wanamaker’s. Harriet mentions the department store in a passage that takes place on her first day of school in 1951, when she enters the fourth grade. I’m sharing it as part of Rainbow Snippets, a Facebook group where readers and writers share six lines from a piece of LGBTQ+ fiction—one for each line of the rainbow flag. The snippet can be from their own work, or just something they enjoyed reading. The whole school was out on the playground, and it was harder than I would have expected to find a short-haired girl in a blue jumper. There were lots of blue corduroy jumpers darting around the swings and monkey bars and jungle gym. Wanamaker’s must have featured them in its back-to-school sale that year. My dress wasn’t new. It was a hand-me-down from my older sister, with a ribbon tie and a skirt made with less fabric than the newer fashions. Shelley and I had done a test run of our first-day outfits the previous week, and no matter how fast I spun around, my skirt failed to billow as dramatically as Shelley’s. 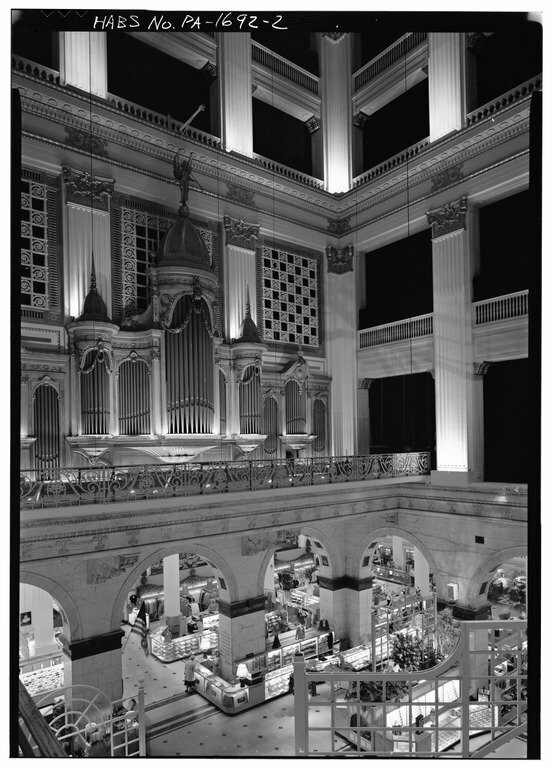 For nearly a century, Wanamaker’s was the leading department store in the northern mid-Atlantic states. 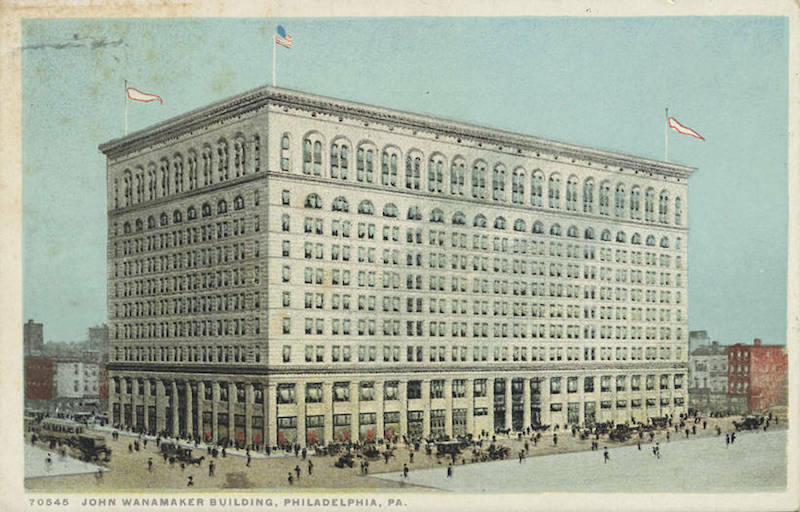 Founded in Philadelphia in 1876 by John Wanamaker, it was the first business in the United States we would recognize as a modern department store. Mr. Wanamaker introduced an important innovation to the retail business: the price tag. His was also the first department store to take advantage of electric lights, the telephone, and pneumatic tubes for moving cash and papers between departments. 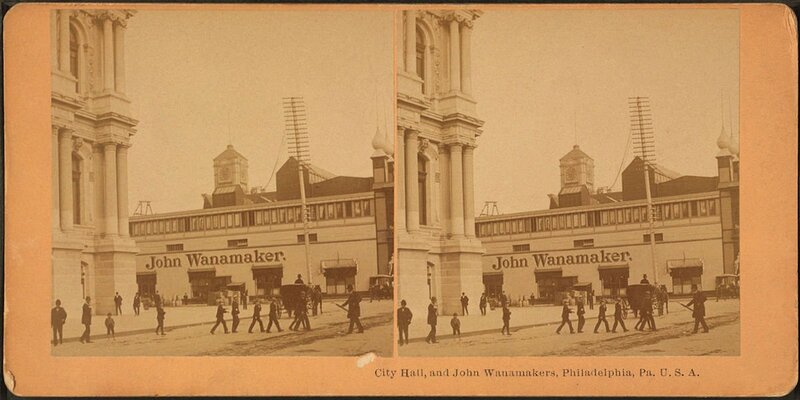 Postcard of the first Wanamaker store in Philadelphia. Image in the public domain. Themed sales were another of his inventions. To boost sales in the slow retail month of January, he held the first white sale in 1978 (“white” means “bed linen” in this context, as they were only available in white). But I couldn’t find out if he had a hand in creating the back-to-school sale. In 1910, he had a new building constructed on the site. It was quite impressive, both inside and out. Postcard painting of the second Wanamaker store in Philadelphia. Image in the public domain. Lobby of the second Wanamaker store in Philadelphia. The organ had been used at the St. Louis World’s Fair and was one of the world’s largest pipe organs at the time. Image in the public domain. Another view of the lobby of the second Wanamaker store in Philadelphia. Image in the public domain and accessed through the Library of Congress. John Wanamaker established a second store in Manhattan in the early 1900s. Over the century, additional stories opened in other parts of Pennsylvania, as well as New Jersey and Delaware, but success didn’t last. In the 1990s, it was bought out by Woodward & Lothrop, which was then bought by Hecht’s, which was then bought by Macy’s. 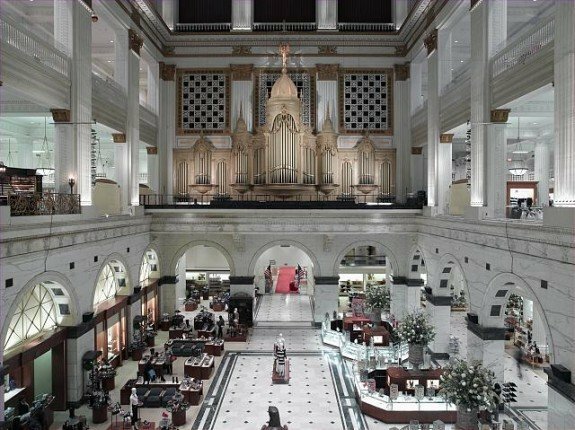 The Philadelphia store has been recognized as a National Historic Landmark and still functions as a department story under the Macy’s brand. Thank you! I’m glad you’re enjoying them. What a bittersweet snippet. I can relate as the youngest in our clan always wearing cousins’ out of fashion hand-me-downs. ~grin~ Nice history lesson and great photos! Thank you for sharing. And Happy Writing! Thank you! I had to wear some of my cousins’ seventies fashions in the eighties and the student reactions were not nice 🙁 At least in the early 1950s the fashions weren’t changing so rapidly yet. But by the end of the decade, that rapid style turnover really started to take off. Ugh, it makes me so sad that even kids are expected to be fashion plates. But that’s a rant for another time, lol! Okay, I love the snippet. But you had me at Wanamaker’s! We didn’t have one locally, but I grew up shopping there when we went to visit my grandparents. I didn’t know all that about the history of the store. Wonderful description laced with character development! The historical details you offered up were fascinating. This is quite the class act you’ve got going here, promotion wise, combining a little education in a fun way with your story snippets and your blurb. Exquisitely done! Thank you! I’m not sure how effective it is at promoting the book, but it sure is fun! Love the background info, and what a great snippet! You really get us into the head of a young girl and what was important to her. I know I’ve said this before, but this story being set in the ’50s brings to mind so many stories of my mom’s lonely childhood. She was an outcast and a loner, but she was so wild and crazy she would ride the city bus all by herself and skip school just to see downtown. I love the terrific photos and information you provide too! Want to read your book for sure! I love the setup and description – draws me in! Loved the snippet with the details about the skirt. Also loved the history lesson. I’d like to see that store. It’s pretty impressive. I believe they still hold an annual concert day with various organists playing. Quite the event! I loved the snippet. Thanks for sharing the photos and history too!